Campbell River has no shortage of scenic spots for romance, and with Valentine’s Day right around the corner, we’ve compiled a list of our top choices for an unforgettable date. Forget the flowers and chocolate this year, and impress your special someone with a picturesque experience for you to #DiscoverCampbellRiver together. For those looking for a once-in-a-lifetime experience, we suggest Air Nootka’s float plane package to Hot Springs Cove on the west coast of Vancouver Island. Take photos along the forested boardwalk and exceed #couplegoals while relaxing in the warm pools. Campbell River’s coastline has stunning panoramic views, where the sand stretches for miles. Take your Valentine for a sunset walk along Saratoga Beach, and bring a thermos with some snacks for an impromptu picnic that will delight the senses. For your adventurous Valentine, surprise them with a snow day at Mount Washington in Strathcona Park. Snowshoe through Paradise Meadows for expansive views of Lake Helen MacKenzie. This winter wonderland creates the perfect backdrop for the perfect photo. Immerse yourselves in local culture at the Campbell River Art Gallery, or look back in history together at the Museum at Campbell River. Insider tip: Wednesdays are free for locals! Cut Outs by artist Amy Wong. Part of the group exhibition Hot Dog Car Wash on now until September 6 in the gallery. Create an intimate experience sure to wow your Valentine by setting up a beach fire for the two of you. We suggest Ken Ford Beach Park at the south end of Campbell River for incredible mountain views. Make sure to bring blankets so you can snuggle up with your sweetie. Great fire on the beach, and the snows still coming down. Merry Christmas everyone and stay safe!! Campbell River has some of the island’s most romantic restaurants overlooking the water. The Angler’s Dining Room at Dolphins Resort is renowned for its rustic cabin design and intimate ambiance, not to mention their Insta-worthy Eggs Benny. For dinner try out the Harbour Grill or Quay West Kitchen for great food and spectacular views. Just remember to make reservations! The weekend special right now in the Anglers Dining Room: Huevos Pollo. Double tap if this made you a little hungry. For a casual date, we suggest biking along the Rotary Seawalk. This 6.2 kilometre paved path offers stunning ocean views that set the stage for a romantic photo op. Bike rentals are available at Pedal Your World or Swicked Cycles. For the new couple, take a tour and tasting at the Shelter Point Distillery just south of town. Copper kasks and twinkly lights indoors, with rolling farmland outdoors make this destination a must-do with your Valentine. Craft beer enthusiasts can grab a flight at Beach Fire Brewing and Nosh House downtown. Tapas featuring local ingredients paired with unique libations are sure to keep the conversation flowing. 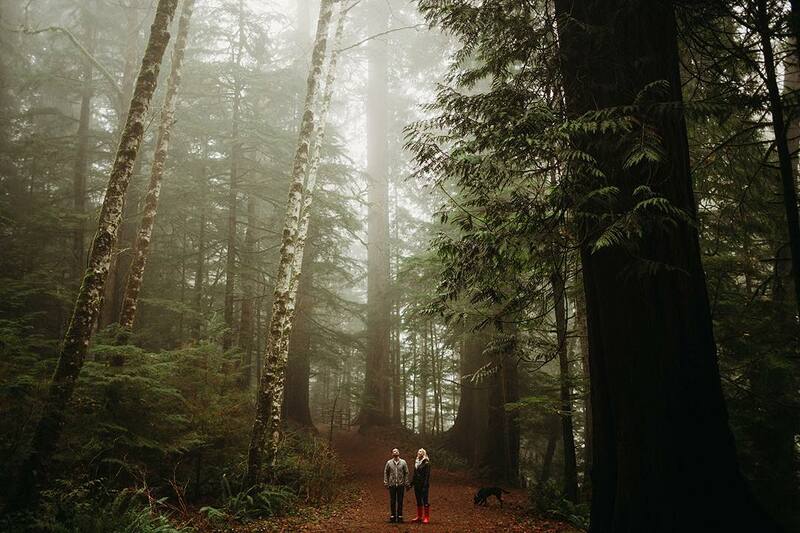 Explore one of Campbell River’s historical old growth forests with your Valentine. For tall tree adventures, we suggest Elk Falls Provincial Park or the Beaver Lodge Lands. These forests are the perfect location to take some fairy tale-worthy shots. This is what fairy tales are made of.